This is the ultimate modern couture beer, made to complement curry dishes, by Karan Bilimoria, son of the Commander-in-Chief of the Indian army. From its conception in a Fulham flat in 1990, to the first bottles brewed in Bangalore, to the leading brand it is today, this ultra-smooth beer delivers superb freshness. Cobra Premium 4.5% ABV Lager. 101 Quality Award Medals at Monde Selection Awards across the Cobra Range, making it one of the most awarded beers in the world. Vegetarian Society approved. Kosher - KLBD. 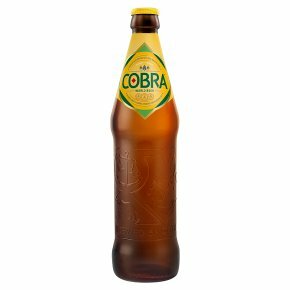 Cobra is made from a complex recipe of seven ingredients and then expertly brewed with fewer bubbles to give it a sophisticated taste. Spicy pure hop oil is used to create unique aromas and flavours, whilst lower carbonation delivers a smooth flavour. It is the perfect companion for any dish, from anywhere in the world.